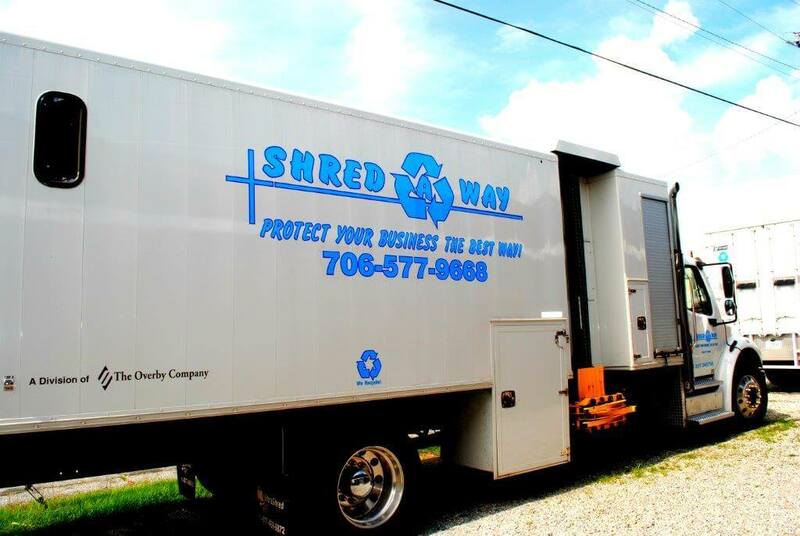 Shred A Way provides a mobile document shredding service that allows us to come right to your location. Our on-site mobile shredding service is perfect for businesses or residents who have busy schedules, who can’t transport their documents to us, or for those that simply prefer keeping their documents on site. Everything is shredded on site, with the ability to witness the shredding first hand. Documents are destroyed before they leave your site. Service is performed by trained professionals who have passed extensive background checks. Our mobile shredding vehicles are equipped with the latest shredding technology for quick and reliable shredding. Mobile vehicles are equipped with comprehensive security equipment to keep your documents secure at all times. Shredded documents are unrecoverable and are 100% recycled. A mobile shredding truck will come to your premises for service. Our trained specialists will collect the documents from the secure containers provided or from the areas you indicate. The documents will then be fed to a fast and efficient paper shredder, capable of shredding thousands of documents in a matter of minutes. After shredding is done, we issue you with a Certificate of Destruction for your auditing purposes, and complete peace of mind. The shredded paper then goes to a recycling facility where it is reused for low-grade paper products (office paper, toilet paper etc. ).